From sunup to sundown, Honeymoon Island State Park offers people a chance to relax on its beaches, hike along its trails and view numerous species of birds in their natural habitat. The barrier island drew 1 million visitors last year and topped a list of the 25 most popular Florida parks. State officials are planning to attract even more people to the 2,800-acre park off the west coast of Pinellas County. The Florida Department of Environmental Protection wants to build 45 campsites on 17 acres of Honeymoon Island State Park that could accommodate overnight stays for recreational vehicles and tents. DEP officials will host a town hall meeting next week in Dunedin to give the public more details on the proposal. The plan, which also seeks to create campsites at other state parks that do not have them, is a push to offer more recreational opportunities and get more people outdoors, said Donald Forgione, park service director for the environmental protection department. The DEP created a draft list of about 50 parks that have the potential to add campsites, said Lane Green, a member of the Acquisition and Restoration Council, a state board that reviewed the proposal. Other state parks in the Tampa Bay area on the list include the Skyway Fishing Pier in St. Petersburg, Weeki Wachee Springs in Hernando County and Crystal River Preserve in Citrus County. Green said he expects the list to be whittled down as DEP investigates how construction would impact habitats and sanctuaries. Jennifer Wallis, the owner of Sherwood Forest RV Resort in Palm Harbor, said talk of campgrounds on Honeymoon Island is surprising because of the park’s reputation for pristine flora and fauna. “I thought it was environmentally protected,” she said. Wallis said Honeymoon Island seems too small for a campsite that will also need new access roads, trails and hook-ups for recreational vehicles. She’s worried about the impact on her RV park, which has 100 camping sites on 13 acres about five miles west of Honeymoon Island. “That could potentially take business away from us,” Wallis said. Vickie Larson, a member of the restoration council, said the DEP has a good track record of protecting its property. The restoration council approved DEP’s proposal last week with a 7-3 vote. Larson cast a dissenting vote, saying the project needs more public input before moving forward. Forgione said the project is still in its infancy and there’s no timetable for when construction will begin. He said he’s not sure if the department will ask contractors for bids or if the state will build the campsites. If private companies design and build the camping areas, they will also operate them, Forgione said. The DEP may ask for a share of the revenue from the overnight fees, which would go back to the budget for parks, he said. Mary Lou Walsh, who spent Monday on Honeymoon Island’s beaches, doesn’t agree with the plan. The idea for more campsites wasn’t driven by a need to raise revenue because of state budget cuts, Forgione said. There’s a “big gap” of state-sanctioned camping areas between Hillsborough River State Park and a park in Manatee County, he said. The DEP oversees 160 parks and one-third of that number has full camping facilities. Green said privatizing campgrounds is new territory. The 3,500 campsites now in use at Florida parks were built by the state and are run by state employees, he said. But allowing companies or individuals to do business on DEP-owned land has been going on for decades, Forgione said. David Downing, the deputy director for Pinellas County’s tourism bureau, said it’s too early for his agency to comment on the DEP proposal. 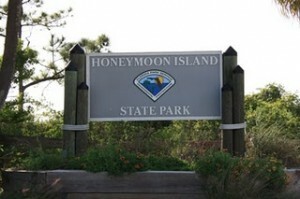 Officials with the Florida Department of Environmental Protection will hold a town hall meeting on Honeymoon Island’s proposed campsites on Tuesday, July 5. The meeting starts 7 p.m. at the Dunedin Public Library, 223 Douglas Ave., Dunedin. This entry was posted on June 28, 2011 at 10:16 am and is filed under In the News, State Parks. You can follow any responses to this entry through the RSS 2.0 feed.